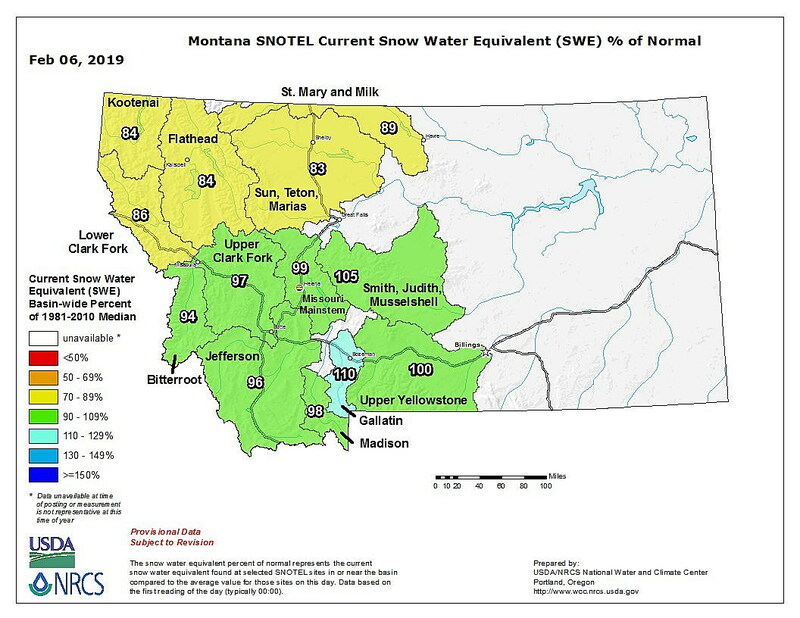 Montanans should cherish the past few days of snow, because the snowpack in most of the state’s mountains was below average at the end of January and far below last year’s accumulation. Statewide, Montana’s January snowpack was about 90 percent of average and about three-quarters of what it was last year, according to the Feb. 1 Natural Resources Conservation Service water supply outlook. Fortunately, the storms that have blown through since last Saturday have increased the snowpack in some areas. So late-season snows could still turn the prognosis around, but the mountains usually receive about 60 to 70 percent of their snowpack by Feb. 1, en route to the maximum in April. 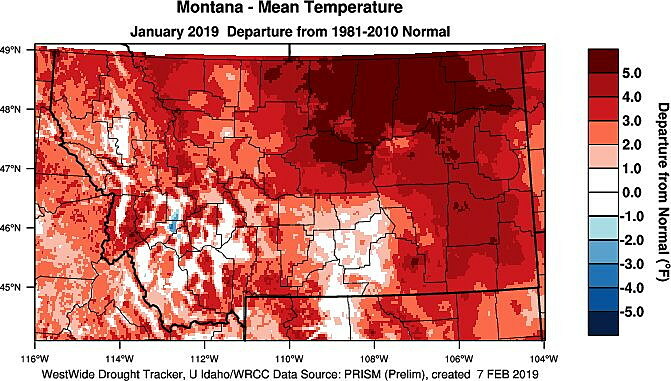 The National Weather Service’s long-range forecast for February through April has Montana receiving average precipitation, although the state, particularly western Montana, is likely to experience higher than average temperatures. That could mean less snow and more rain. During January, the average temperatures across a vast majority of the state were 3 to 5 degrees above normal. Deep mountain snowpack is important to the state, because it provides a steady supply of water to streams as it melts throughout the summer. Less snowpack means drier conditions that can combine with high summer temperatures to worsen drought and the chance of wildfires. Remember that the NRCS uses an average based upon measurements between 1981 and 2010, so potentially the snowpack amounts are even less than what they were in the 1950s or even the 1970s. Due to a relatively dry December, statewide snowpack levels at the start of the year were already below average and continued to drop until a storm system arrived in the third week of January. That helped the snowpack in a few mountain ranges, such as the Gallatins and the Little Belts, keep pace with where it should be. Snowpack levels are the best – about 110 percent of average – in the mountains around the headwaters of the Missouri River, from Three Forks to north of Helena. Closer to home, the snowpack in much of western Montana was only about 85 percent of what it should be on Feb. 1. The snows that feed the lower Clark Fork River basin downstream from Missoula are 84 percent of average, while the Bitterroot basin is sitting at 87 percent. The last round of snow bumped the Bitterroot up to 93 percent of average but didn’t improve the lower Clark Fork much. The only bright spot on the western side of the Continental Divide is the upper Clark Fork basin upstream of Missoula where snowpack is average, thanks to snow that fell in late October and early November. Even so, a few areas on the western edge of the basin – the Sapphire Range feeding Rock Creek and the Swan Range – are below average due to lighter than normal snowfall in January. While snowpack is low, precipitation amounts have been even worse. During January, much of western Montana received barely more than two-thirds of the precipitation it should have. 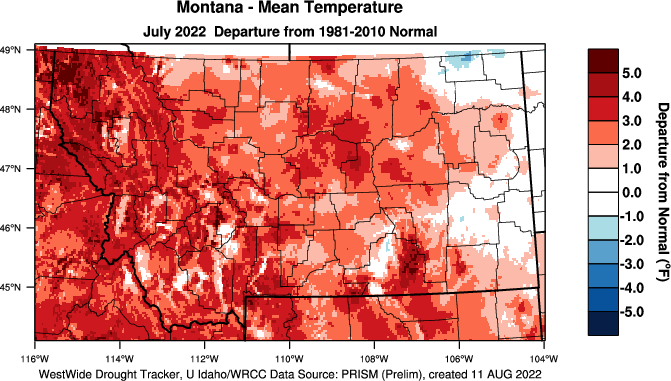 That’s a concern for the northwestern corner of the state, which is abnormally dry due to hot, dry summer weather since July 2015, and areas of Flathead and Lincoln counties are in a moderate drought as a result. River basins in the northwest region of the state typically experience their “wettest” months from early November through the end of January. Fortunately, the recent snow boosted precipitation totals a bit. While basins east of the Continental Divide did better, the state overall received only 83 percent of the moisture it should have during January. But so far, most reservoirs around the state are full of water, so if dry conditions continue, flows in some rivers can be maintained for a little while. On a side note, the Hoodoo Basin SNOTEL site on the Montana-Idaho border southwest of Superior, which measures snowpack in part of the lower Clark Fork basin, lost communication due to an antenna bent by heavy snow on Dec. 28. The government shutdown forced crews to wait until a month later to repair it.